Gut bacteria is also known as gastrointestinal microbiota or, more simply, gut flora. By definition, the term microbiota refers to a group of microorganisms that inhabit a certain environment, in this case the gastrointestinal system. 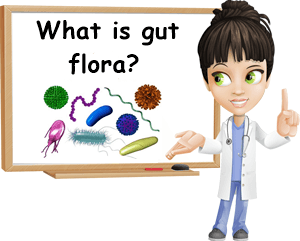 The term flora essentially means plant life, vegetation and refers to bacteria, fungi, yeasts and protozoa from the gastrointestinal system that are seen as plant-like, microscopic life forms. The term gut bacteria refers strictly to bacteria that colonize the gastrointestinal system, but is commonly used to refer to all types of microorganisms present in the gastrointestinal system. Gut flora is a natural presence in the human gastrointestinal system and, for the most part, a keeper of good health. Types of intestinal bacteria. There are 3 types of gut bacteria: good gut bacteria, bad gut bacteria and commensal gut bacteria. Good gut bacteria essentially lives in harmony with the human gastrointestinal system in a mutually beneficial association. It provides health benefits to justify its existence. Bad gut bacteria refers to pathogenic bacteria with the potential to cause disease. For the most part, pathogenic gut bacteria is lesser in numbers compared to good gut bacteria and it is the greater numbers of the latter that keeps the former in check. Commensal gut bacteria refers to intestinal bacteria that is neither beneficial, nor disease-causing, but relies on the human gastrointestinal system to survive. How does gut bacteria work? Ideally, in a healthy gut environment, beneficial bacteria is predominant. Its functions include synthesizing vitamin K and B vitamins, regulating nutritional status, producing enzymes to break down macronutrients like protein, carbohydrates and fats, fermenting fiber, removing toxic secondary products of food metabolism by converting them into non-toxic elements or reducing them to non-toxic constituents, aiding in the absorption of essential nutrients and maintaining overall gut flora stability by suppressing the growth of pathogenic bacteria and fungi. So what (good) gut bacteria does is regulate gut health. If good gut bacteria numbers decrease as a result of antibiotics use, severe illness, parasitic infections, changes in nutrition habits such as switching to a liquid diet, eating processed foods, stress, bad gut bacteria grow in numbers and become prevalent, ultimately causing disease. When there is severe illness, even some commensal gut bacteria that normally live and feed in the gastrointestinal system without producing side effects can grow in numbers enough to become overwhelming on the gastrointestinal system and ultimately produce disease. This is why it’s so important to prevent gut flora imbalances by eating a healthy diet, rich in probiotic and prebiotic foods (read more about what Foods to Eat for Healthy Gut Bacteria). Gastrointestinal flora functions strictly within the gastrointestinal tract. What this means is that the beneficial functions of gut bacteria are restricted to the stomach and intestines. If there were an injury that would allow the microorganisms in the gastrointestinal tract to escape to other parts of the body, then all gastrointestinal flora would become pathogenic and cause disease, irrespective of their functions within the gastrointestinal tract. Because once out of the gastrointestinal system, the gut bacteria and other flora are no longer in their natural environment and can no longer carry out their normal, natural functions that would benefit both them and us as hosts. 1) Vitamin synthesis. What vitamins do gut bacteria produce? Vitamin K2, vitamins B12, B9, B6, B5, B3, B2, B1 and biotin (vitamin H) are synthesized by bacteria in the human gastrointestinal tract (Lactobacillus, Bacteroides, Bifidobacterium, Enterococcus). Most nutrients are absorbed in the colon, where most of these bacteria reside. 2) Weight management. A healthy gut flora can help you lose weight. Because of the enzymes bacteria in the gastrointestinal system secrete to break down components in food in simpler constituents, they regulate how various elements are absorbed and deposited and can essentially determine whether your lose or gain weight. A healthy gut ecosystem can help you maintain a healthy weight by regulating metabolic responses to an excess calorie intake. 3) Break down of food and absorption of nutrients. In addition to the stomach acid which breaks down food for digestion, gut bacteria further decompose it into simpler constituents with the help of enzymes they produce to make it more bioavailable, contributing to the efficient utilization of protein, carbohydrates, fats and other elements and good nutrition. 4) Fiber fermentation. Dietary fiber is essentially indigestible plant material. That is, indigestible for us. But gut bacteria can ferment fiber and feed on it to maintain healthy populations which carry out varied metabolic processes that contribute to our nutritional status and overall gut health. 5) Maintain gut health and more. As they break down dietary fiber into simpler constituents, gut bacteria also contribute maintaining a healthy gut lining. The by-products resulting from the decomposition of indigestible dietary fiber are used by the heart and bones. 6) Synthesize amino acids. Studies show gut bacteria are able to synthesize quite significant amounts of several amino acids: leucine, lysine, threonine. There is research that suggests beneficial gastrointestinal microbiota helps produce up to 20% circulating threonine and lysine, in adults and up to 20% of total dietary leucine in adult men. Amino acids are important for building and repairing muscle tissue, impact breathing, energy metabolism and brain function. 7) Hormone-like activity. Gut bacteria produce enzymes to break down food in its simplest constituents and make B vitamins and vitamin K. They also synthesize enzymes to regulate how every nutrient and useful by-product of the digestion process is absorbed. They even mediate the uptake of serotonin and even melatonin. Because they bring a significant contribution to regulating mood, appetite, sleep, digestion and multiple aspects of metabolism, the gut flora ecosystem is considered a sort of endocrine system with hormone-like activity. 8) Regulates brain function. Good gut bacteria produce amino acids, B vitamins and regulate their absorption as well as the uptake of neurotransmitters like serotonin and melatonin, all important functions with a direct impact on brain and nervous system activity. 9) Boost immunity. Our individual gut flora is like an ecosystem of its own, functioning as a freestanding unit. One of its most important functions is modulating the immune system for better host health. How does gut flora prevent infection? By suppressing the growth of pathogenic bacteria, yeasts and other microorganisms. For example, good gut flora competes for nutrition in the gut with bad gut flora. It also modulates the gut environment to favor the growth of beneficial flora like itself, thus successfully inhibiting pathogenic strains of bacteria that could produce infection and disease. Moreover, gut flora helps the lymphoid tissue in the lining of the gastrointestinal system, an important element of the immune system, develop and educates it as to which microorganisms to tolerate and which not. 10) Regulate digestion. A healthy gastrointestinal flora can suppress the immune system in the gut and lead to better tolerance to different kind of food, less food sensitivities and reduced inflammation and adverse reactions. This holds potential benefits for inflammatory diseases of the digestive system such as irritable bowel syndrome or leaky gut. 11) Other benefits. Studies show an association between healthy gut microbiota and healthier cholesterol levels, reduced risk of colon cancer, autoimmune, inflammatory conditions, lower rates of tumor formation, better digestion and cardiovascular health, lower rates of food intolerance or allergies, possibly lower obesity, diabetes risks. 1) Bacterial intestinal infection. It occurs when less good gut bacteria cause an overgrowth of bad gut bacteria, resulting in infection and disease. Diarrhea is a telling sign of infection. Sepsis can occur when gut microflora (good, bad, commensal) escapes outside the gastrointestinal tract, producing infection and disease. 2) Inflammation. Imbalances in gut flora can result in inflammatory responses, usually at the level of the gastrointestinal tract, often manifesting as food intolerance with symptoms ranging from nausea, vomiting sensation and diarrhea to excess bloating, burping and general stomach upset. 3) Chronic, inflammatory or autoimmune disorders. Obesity, diabetes, cardiovascular disease, autoimmune disorders like pollen and food allergies, asthma, inflammatory diseases of the gastrointestinal system like Crohn’s disease, IBS, colitis, and even some nervous system diseases have been associated with gut flora imbalances. 4) Cancer. Some microorganisms inhabiting the gastrointestinal system and some of the by-products of their metabolism can increase the risk for certain cancers. Example: Helicobacter pylori can cause stomach cancer. How to restore healthy gut flora. Restoring gut flora can be done by eating foods that increase good gut bacteria numbers. These include probiotic and prebiotic foods. Natural foods for gut bacteria health should be introduced slowly into the diet, one at a time, over the course of several weeks to prevent side effects like bloating, burping, nausea, vomiting sensation, acid reflux, stomach heaviness and general stomach upset. Naturally fermented food products, ideally produced using a preparation method as close as possible to the traditional one are better at restoring normal gut flora and boosting gut flora variety. 1) Fermented and acidified milk products (soured milk, kefir, yogurt, buttermilk, fermented cheeses). These are excellent probiotic foods, containing live beneficial bacteria. 2) Fermented, pickled vegetables: sauerkraut, kimchi, pickled vegetables (beets, cauliflower, watermelon, cucumbers etc.). They have both probiotic and prebiotic properties. 3) Other fermented products: natto, fermented bean paste, fish. If your doctor recommends it, you can use prebiotic supplements.